This entry was posted on September 30, 2010 at 11:53 pm	and is filed under Nia. Tagged: 52 Moves of Nia, Jazz Dance, Nia class, Nia Class in San Jose, Nia Playshop, Nia Practice, Nia Willow Glen, Nia workout, Nine Movement Forms, Pilates, San Jose Nia, San Jose Nia class, San Jose Nia practice, San Jose Pilates, San Jose Yoga, Tae kwon do, Tai Chi, Willow Glen Nia, Willow Glen Workout, Yoga. You can follow any responses to this entry through the RSS 2.0 feed. You can leave a response, or trackback from your own site. One of these days we’re gonna dance together!!! I’d love to take your workshop. 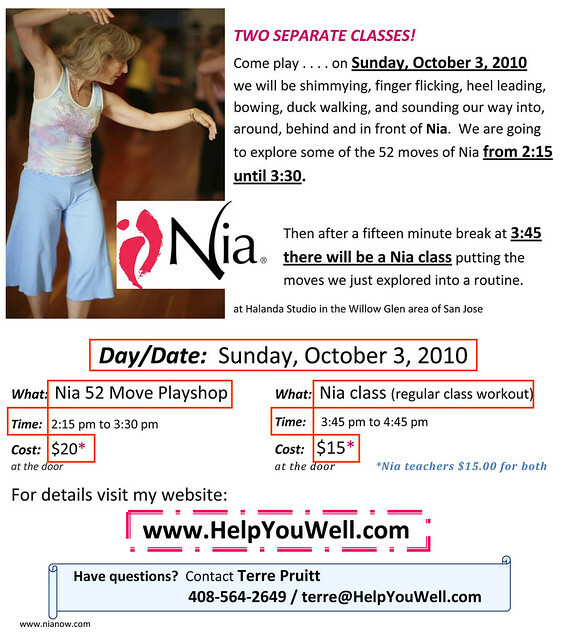 I love how you’ve outlined the Learn, Move, Energize facets of Nia…thanks for the reminder!!! I do not doubt that we will dance together one of these days. I don’t know when, but I know we will. I was writing about the Learn, Move, Energize when I realized that I could tie it to my Playshop. I was amazed that I actually hadn’t thought of that first. I actually try not to post “dated” things on my blog, but . . . . . I decided, why not? The Learn, Move, Energize is the focus of the post, I just slilp in the event at the last minute . . . and it really was. Hugs to you, Miss Jill! I like these steps…makes it easier to learn the technique…thanks! Oh yes! These are the steps we follow to learn a routine. I am always bragging about how great the training material is that Nia Technique puts out. On the DVD that teachers get it has different versions of the routines addressing each one of these steps. I just remembered I wanted to post about that. Cool. Thanks for the reminder. Now I can even tie this post with the new one. Yay!